Saint Panagis Basias was son of the pious and wealthy couple Michael Typaldos-Basias and Regina Delaporta. He was born in Lixouri, Kefallonia in 1801. Because his wealth afforded him an excellent education, Panagis received very good theological and philosophical training and learned to speak Italian, French and Latin besides his native Greek language. At the age of 20 he began his career as a grammar school teacher due to his linguistic skills. Soon he became inspired by the radical preaching of Kosmas Flamiatos and Eusebios Panas, two men of the Church who believed that the British occupying the Ionian Islands at the time were essentially tyrants attempting to undermine the population's Orthodox faith with Protestant teachings. As a result, he left his official teaching post, and continued his mission by giving lessons privately at home. At the age of 26 Panagis, following his father's death, felt a natural inclination as well as the influence from the character of the great ascetics of Kefallonia Saints Gerasimos and his neighbor Saint Anthimos, to leave everything behind and go to the tiny island Vlahernon off the coast of Livathos. This monastery was used as a place of exile for clergymen by the British rulers. 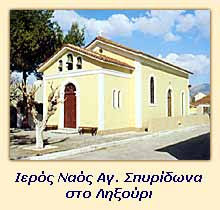 Exiled on the island at that time was the famous cleric Nikolaos Kantounis from Zakynthos. However, his widowed mother's and orphaned sister's pleas forced him to cut short his stay at Vlahernon. He returned to the world but his entire life proved to be a continuous ascetic striving and adherence to the monastic existence he had chosen. He returned to Lixouri in 1828-9 and soon thereafter was ordained a Reader. 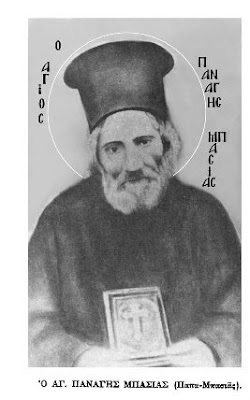 In 1836 he was ordained as a deacon and a priest by the Archbishop of Kefallonia, Parthenios Makris. Upon his ordination he was given the name "Paisios". He then served as priest at the Monastery of Saint Spyridon in Plati Gialo near Lixouri where he originally intended to serve as a monk. There he liturgized and preached on a daily basis, spending the remaining time of his day visiting the homes of the faithful who were in need of comfort, charity, spiritual guidance, relief and compassion. He was an exceptional confessor who impressed the image of Christ upon the souls of the faithful. 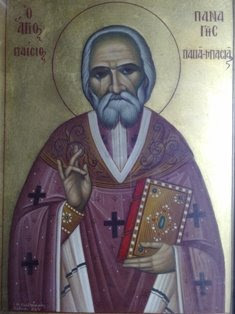 Throughout his life Saint Panagis gave himself over to charity work and ministry towards the sick and suffering, even distributing his entire wealth to the needy. God had granted him the gift of prophecy which he used to foretell future events to those around him, something that is mentioned in the proposal for his sainthood. Reflections of his many miracles, prophecies and accounts of his devout life are still with us. With his gift of clairvoyance he was able to read the hearts of the faithful and expose their private sins so as to gently lead them to repentance. His widespread fame as a miracle worker forced him to claim mental illness ten years after his ordination in 1846 though in reality he became a "fool for Christ's sake", embracing what many saintly men before him had in order to avoid the fall into arrogance and egotism. During this time he was tortured by a nervous breakdown and was deprived of sleep walking the streets at night and shouting out loud, among other things. When he would come back to his senses it was as if he was in terrible fear and weakness. However his biographer and contemporary, Father Zisimos Typaldos, informs us that the faithful understood this to be a test and were not bothered by it. During these times the faithful would still come to him and with devotion kiss his hand. They knew this was a test many Saints of the past had endured for a life of humility, what Saint Paul called "a thorn in the flesh"(2 Cor. 12:7). On May 21, 1864 he experienced the joy of the Union of the Ionian islands with Greece, a goal he had worked hard for by preaching and cultivating the Orthodox tradition during a period of political and social turmoil. Father Basias had lived with his widowed sister in Lixouri until 1861 when she passed away. Before this and after he lived with his cousin Andreas Typaldos-Basias during which time he was given money by insurance to be taken care of (1864). 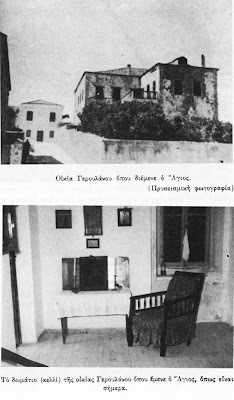 The devastating earthquakes of Palliki in 1867 destroyed his house and forced him to live as a guest from then on, "poor but enriching others" and "having nothing and having it all", in the house of his cousin John Geroulanos (he was the father of the famous surgeon Marinos Geroulanos). This John was the son of the sister of Father Paisios' mother Regina. In return for the kind hospitality of his cousin John and his family, Father Paisios became a protector of the household and aided them with his prophetic and healing gifts (he had saved John's life when he was sick years earlier and near death and even married John to his wife). John considered the hospitality he was giving as if he was giving it to the Lord Jesus himself. Among his prophecies was that he foretold to John that his son Marinos would become "a great, great man" and often repeated this. The Geroulanos family highly honored the Saint and to this day their descendants pay special reverence to him. 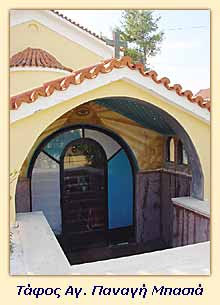 The son of Marino, John, was born in 1904 and became the care-taker of the Church of Saint Spyridon, where Father Paisios liturgized following his departure from the Monastery in Plati Gialo , and the tomb of the Saint. They allow the faithful to this day to visit his memorable house and the room (or what the faithful refer to as his "cell") he stayed in for the rest of his life. Between 1882-1887 he remained prostrate and confined to his bed, during which time many visited him to receive counsel, confess their sins and seek his prayers. He endured this trial with patience and perseverance. Day and night the door to his cell was always open by his request so that anyone could come to him at any time as was needed. He passed away peacefully on June 7, 1888 at the age of 88 years old in Lixouri. At a massively attended funeral service held over three days, the eulogy was delivered by the Metropolitan of Kefalonia Germanos Kalligas. Day and night the faithful came to pay their respects over a period of 50 hours or so without stopping, and many photos were taken of this event of which one is known to be preserved. The Saint's praises were delivered by Archbishop Germanos Kalligas, Father Zisimos Typaldos (his biographer) and written by Amilkas Alivizatos, Father Elias Mastrogianopoulos, the Lixourian born Bishop of Trikki and Staggon Cheroubim Anninos and the Reverend Konstantinos Gellis. 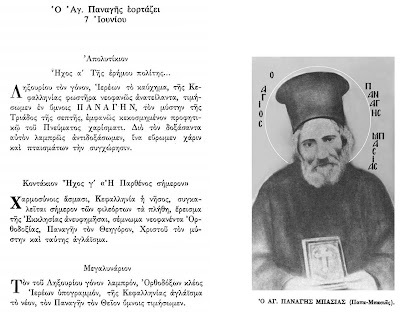 The radiance of his personality was so immense that even the satyric poet Andreas Laskaratos, known for his anti-tradition and anti-clergy views, noted in footnote 6 of his book The Mysteries of Kefallonia that: "I have honored and loved virtue every time I found it in the clergy". 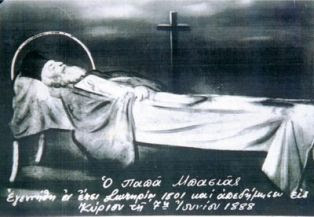 His pious life and the repetitions of the miracles he performed remained alive in the conscience of devout Christians for the next 88 years, leading the son of Marinos, John Geroulanos, to request the transfer of his relics to the Church of Saint Spyridon in Lixouri. The Metropolitan of Kefallonia Prokopios Menoutis had his sacred remains transferred on June 6, 1976. 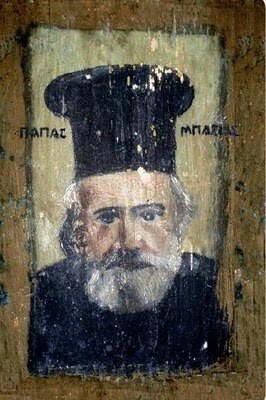 The procedure to recognize Panagis' official sainthood by the Ecumenical Patriarchate was delayed by unfortunate ecclesiastical problems in Kefallonia. After his enthronement, the new peacemaker Metropolitan of Kefallonia Spyridon, performed with full honors the sainthood induction ceremonies on September 7, 1986. The ceremonies, following the Patriarchal and Synodal Decree issued on February 4, 1986, were attended by representatives of the Ecumenical Patriarchate, the Holy Synod, and a large number of bishops. The faithful have the opportunity today to honor and venerate the Saint's tomb and sacred remains, kept in a silver larnax in Saint Spyridon's Church in Lixouri. A portion of his relics is also displayed for veneration and celebrated at Holy Cross Theological School in Brookline, Massachusetts. - An epidemic of cholera inflicted the people of Lixouri. Fear spread to all the inhabitants and all the dead were taken to the cemetery of Saint Anna without a proper funeral. Father Basias however had no fear in light of the necessity to say the funeral prayers for the departed for their salvation. Even at night he would go to the cemetery and say prayers for all those who died from the epidemic saying the Trisagion Service for each of the dead. The police often saw him at night praying for the departed. - There are various accounts that Saint Panagis was never affected by the rain, that is, he would not get wet. On one rainy night Saint Panagis was spotted by police in the cemetery of Saint Anna. He was praying for the deceased by himself holding a lantern, though the police noticed the rain never touched him and his uncovered lantern never went out. On another occasion a man named Evangelos Kokkolis reported how he had heard accounts of various miracles by Father Basias told to him by his uncle Dionysakis Razis, but did not believe them. He owned a store in Lixouri with his brother and one very rainy day Father Basias came to his store and just stood outside leaning against the outside wall without any worries of entering the store to escape the rain. Father Basias entered the store only when the rain stopped and immediately sat next to Evangelos. Evangelos had seen Father Basias standing outside his store in the pouring rain for hours and a strange curiosity came over him to touch the back of Father Basias as well as his sleeves. It was then that he noticed that Father Basias was completely dry. Immediately he left his store and ran to the house of his uncle Dionysakis Razis, and as he ran up his stairs was yelling: "I touched him, I touched him!" His uncle asked: "What's wrong with you? Who did you touch?" Evangelos replied: "Father Basias." He then related to his uncle all that happened. - Spyros Mourelatos Tzamanis had a 10 year old child that suffered from epilepsy. He took his child to Father Basias, who did the sign of the Cross over the child and said: "Spyro, take the child. He is well." Anastasios lived another 80 years and never had a dizzy spell again. - The following miracle was related by the grandson of protopsalti Vasileios Drakopoulos, a friend of the Saint, and took place as follows. In Argostoli there lived a rich family consisting of a husband and wife and their two children. They were a very pious family, especially the wife who often performed good works. After a time the husband died and the woman was left widowed with two children. This event caused the widow to zealously perform even greater good deeds, helping those who suffered and the poor, visiting the sick and helping them in their homes, visiting the sick also in hospitals and those in prison, and lead many to greater faith in Christ. When her oldest child reached 21 years of age, they were all seated at the dinner table when he felt a sharp pain in his head. They brought him to his bed and called the doctor while the mother sought refuge before her icon-corner and prayed all night for her son to the Theotokos. The next morning her son passed away. Very mournful, the mother of the child continued performing her good christian deeds. After about a year had passed her other child also felt a sharp pain in his head at the dinner table and collapsed. They called the doctor and he informed the child's mother that there was no hope in saving his life. She again sought refuge all night before her icons in the saving power of God, the Theotokos and Saint Gerasimos. The next day the doctor informed her that her younger son died as well. The woman had suffered enough. She became very angry at her situation and constantly cursed God and His Saints, forsaking as well all her good deeds she had been perfoming. She also became reclusive and refused visitors from entering her home. At this time she also gave two photographs of her sons to a good artist to reproduce, and placed these paintings in her living room on opposite sides of the walls. She also placed an oil lamp next to each photo and lit it once in a while and often spoke to her children through their paintings. One day Papa-Basias travelled to Argostoli holding his cane and immediately went to the house of this sorrowful woman. He knocked on the door and she saw an unfamiliar priest from her window, causing her to swear at him telling him to leave. At his third knock he calmly asked to let him in because he had something to tell her, but she just swore at him again. Papa-Basias then said: "Either you open, or I'll open", and with his cane he made the sign of the Cross over the door and immediately the door opened on its own. Papa-Basias entered the house and began climbing the stairs, leaving the woman who saw this voiceless out of fright and unable to say a word. Papa-Basias then headed for the living room and told the woman to follow him. He opened the door to the living room and told the woman to sit in the corner to see something she never expected. As Papa-Basias began to pray the two photographs came off the ceiling and became alive in the middle of the room. The two young men in the photos began to fire bullets at one another to the point where they both fell dead. Afterwards the portraits returned to their places as if nothing happened. This phenomenon frightened the woman very much. Papa-Basias then explained to the woman: "My lady, God in his love for you saved you from seeing what you just saw, and took your two children away by a natural death instead. Your two children had fallen in love with the same woman, and they would have died in the same way as you saw. For this reason you should now repent and thank God and continue in your former christian way of life." The woman indeed repented and performed even greater christian deeds than ever before with all the strength of her soul and body. - During the time Saint Panagis was confined to his bed he had a visit from the new Metropolitan of Kefallonia Germanos Kalligas, whom he informed that he would eventually become Archbishop of Athens and All Greece. This came to pass as he had foretold. - A woman by the name of Chrysanthi had a husband named Eustathios Typaldos-Alphonsatos. She was widowed at a young age with two children. Father Basias told her in his few words: "You will remarry...You won't change your name...One child...John...Me." Chrysanthi Typaldos-Alphonsatos remarried after a few years to a relative of her deceased husband named George Typaldos-Alphonsatos. She was only able to bear one child with her new husband and had this child baptized by Father Basias who had him named "John". This prophecy was related to Metropolitan Procopios by Chrysanthi's grandson. - There was a great debate in those years in theological and ecclesiastical circles regarding whether man was comprised of two properties (body and soul) or three properties (body, soul and spirit). Apostolos Makrakis had proposed the theory that man consisted of three properties. 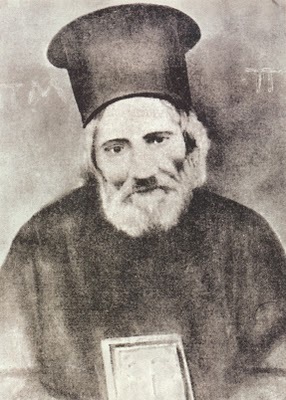 Archimandrite Eusebios Matthopoulos, founder of the Zoe Brotherhood, wondered over the truth of this matter which divided the theological thought of Greece. One day Father Eusebios travelled to Kefallonia and arrived in Lixouri to preach and meet with the renowned elder Saint Panagis. As he was walking in Lixouri he noticed a short ascetic looking priest walking quickly towards him and without greeting him said to him: "Two, two - not three!" Upon saying this he quickly rushed off. These few words had a striking impression on Father Eusebios which he joyously interpreted towards his thoughts on the number of properties in man. That man is comprised of body and soul alone with the spirit merely being a property of the soul is the correct patristic anthropology of the Orthodox Church. Realizing that Kefallonia had a true servant of God, Father Eusebios spoke Saint Panagis' praises throughout his life. - The sister of Vasilios Papadatos died while he was serving in the military. He loved her very much. In his dreams he saw his sister and she told him that they had mistakenly buried her alive. When he came back from his duties he wanted to dig up her grave, but he was stopped by authorities. Troubled he sought out the advice of Father Basias. Father Basias was paralyzed at this time, so when the soldier entered his room he was told by the Saint before he said anything: "Be at peace my child. Your sister was dead when they buried her." In awe of this wonder, Vasilios believed Saint Panagis and was at peace. - Dionysakis Razis had a child who lived in Odessa named Gerasimos. It had been a while since he wrote his parents and they began to worry very much. One day Dionysakis went to church and would routinely sit in the stall near the chanters. He sat with deep thoughts running through his head regarding the well-being of his child. At that moment Father Basias entered the church holding in his right hand a piece of basil leaf with which he tapped the forehead of Dionysakis saying: "Letter! Letter on October 1st!" Upon hearing this Dionysakis was filled with joy because he believed very much in Father Basias and highly held him up for honor and reverence. When the 1st of October arrived Dionysakis went many times to the Post Office to receive the promised letter, but there was nothing. Over dinner his wife began to mock his utter blind faith in Father Basias. But at 10:00pm there was a loud knock at the door by Mr. Sklavos who had come from Odessa with a letter from Gerasimos, saying: "Dionysaki, you have a letter from Gerasimo. I came by your house first, so take it quickly because I have to rush to Spartia to see my mother who I havn't seen in years." Mrs. Razis never doubted Father Basias again. - Father Basias had a helper that was about 14 or 15 years old that believed in him very much. One day a family approached the boy asking him to bring Father Basias to their home so as to read prayers over a sick member of the family hoping for healing. The boy helped Father Basias get ready and as he tried to tie his shoes Father Basias continuously shook his legs. When he managed to tie his shoes they left for the house of the sick person, but on the way Father Basias said: "The place you're bringing me has a rotten bed", meaning that the sick person had died. When they arrived at the house, they saw the mourning neighbors entering the house. 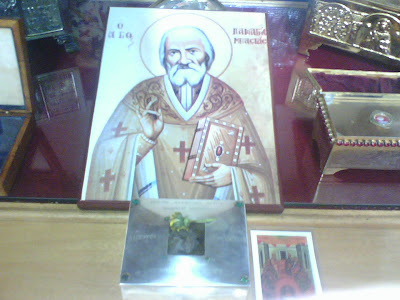 - Saint Panagis at one time liturgized in the Church of the Virgin of Typaldaton. One night there was a sick man who had a desire to receive Holy Communion so he sent a relative to bring Father Basias so as to receive the Holy Gifts. On the way to bring Father Basias this relative instead saw him coming towards the house of the sick person holding the Holy Gifts. At this the relative of the sick man was in wonder how Father Basias knew to come at that moment. - One day a man was eating sardines at a tavern in Lixouri on a Wednesday, which is traditionally held to be a day of fasting from fish among other things. Father Basias came up to him at the tavern and told him: "For all the sins you commit, today on Wednesday you chose to eat sardines." Father Basias then threw the sardines away. - Mr. Foteinos Mourelatos travelled to Lixouri and bought some fish with other villagers. While the fisherman was packing the fish for him he found an opportunity to steal some fish and hid them in his handkerchief and mixed them with the other fish. When they left he told the others that his fish smelled bad and asked about theirs, to which they replied that theirs smelled very nice. At the bridge they met up with Father Basias. Out of reverence as it was the common custom everyone got off their animals and reverenced him. Father Basias told Foteinos to unravel his handkerchief because his fish smelled, and proceeded to remove the fish that were stolen from the fish that he bought. He then told him that the fish he had stolen were the ones that smelled while the others were good. This caused Foteinos to repent and was the occasion to increase his faith. - One day while staying in the house of his cousin John Geroulanos, a poor woman came to the house seeking a little bit of food to eat for her children while Father Basias was away. They gave her a bit of the leftovers, but the freshly made food they did not give since they were expecting guests that day. When Father Basias arrived home he took off his socks and threw them into the newly-cooked food and spoiled it, asking: "Why didn't you give from the fresh food for the mother and her children?" Fear and shame came upon the household, and after asking forgiveness made sure that something like that would never happen again.